Monitor the burgers closely in the skillet to avoid overcooked, dry patties. Let's face it -- freshly prepared food is almost always better than frozen, but frozen decreases the need for frequent trips to the grocery store. When you are craving a juicy burger, the frozen box of burger patties in your freezer can stand in for fresh ground beef. Cooking the patties in a skillet saves you time setting up a grill. You can cook the patties straight from the freezer, and if you do it properly, they should come pretty close in taste to fresh burgers. .
Heat a large skillet, preferrably cast iron, on the stove over medium heat. Lightly oil the skillet with vegetable oil if the beef is lean or if you are preparing a chicken or turkey burger. Place the frozen burger patty pan into the pan once it is fully heated. Let it cook on one side until you start seeing the juices run clear. You can cover the skillet with a lid as the patty cooks, which infuses it with steam, keeping it moist and also cooking the burger a little faster. However, the patty won't have that crispy sear on the outside. Flip the burger with a spatula and continue to cook until a meat thermomter inserted in the middle reaches 160 degrees Fahrenheit for beef. 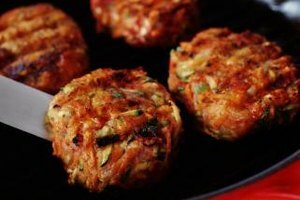 For turkey and chicken patties, they must be cooked to at least 165 F. Remove from heat and serve on a burger bun with toppings of your choice. Depending on the brand of frozen burger you purchase, they may or may not be preseasoned. Consider preparing your own burger patties from top quality ground beef so you can season them to your liking before freezing. Add flavorful topping such as sauteed onions, bacon, and your favorite type of cheese.